Are you thinking about how you can make a difference in 2018? 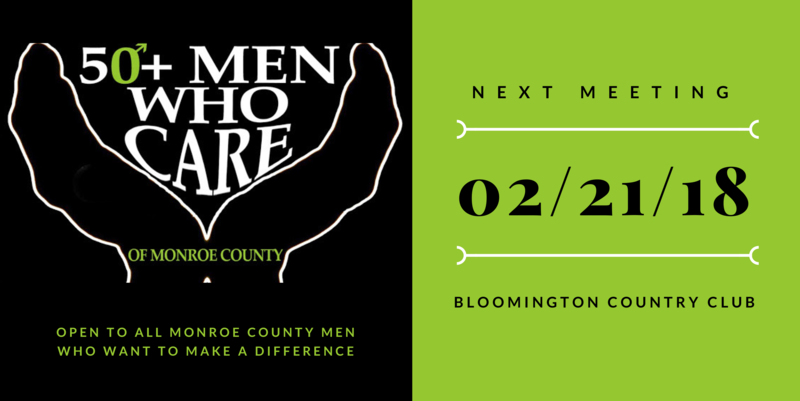 YOU’RE INVITED to 50+ Men Who Care Bloomington and Monroe County‘s next meeting on Wed, Feb 21. Come and learn how this giving circle supports local nonprofits that are saving lives, improving lives, and making our community a better place. * Provided 250 full scholarships for Boys and Girls Club of Bloomington summer camp. * Purchased a bus for Girls, Inc.to use to pick up girls from schools for after-school programs. * Supported the training and development of multiple CASA advocates for children. * Trained and matched over 50 Big’s and Little’s in the Big Brothers Big Sisters program. * Supported hundreds of backpack meal programs for Community Kitchen’s summer feeding programs. * Provided support for multiple classroom projects for MCCSC teachers to enhance student experiences. * Provided dental and vision care through Volunteers in Medicine. * Provided hundreds of family meals through the Hoosier Hills Food Bank. 50+ Men Who Care is open to all men from Monroe County, and can support any 501-c-3 organization. Socializing begins at 5:30 p.m. with a business meeting to follow from 6:00 p.m. to 7:00 p.m.